On the outskirts of Bundeena, 5.6 hectares of pristine bushland (figure 1) is now in the hands of a developer. 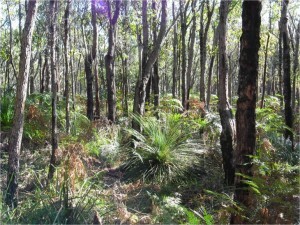 Situated within the area known as Spring Gully, the land is indistinguishable from the surrounding Royal National Park (figure 2). The land was donated to the Scouts in the 1960s for community use. For decades it was in community ownership and has remained effectively conserved to this day. In June 2013, Scouts sold the land to a private developer, despite an offer for a community buy-back. In March 2013, the local community formed the Spring Gully Protection Group which joined with the Foundation for National Parks and Wildlife to purchase the land for donation to the Royal National Park. Scouts rejected the Foundation’s final offer of $300,000 and sold the land to the current owner for reportedly $25,000 more. The land is classified as “greenweb core habitat” with endangered ecological communities (EECs). Mature hollow bearing angophoras and bloodwood provide vital habitat within the riparian corridor for several vulnerable species including the eastern pygmy possum, sooty owl, powerful owl and the grey-headed flying fox. The land comprises a large area of the Bundeena catchment, forms the headwaters of Spring Creek and contains wetland. Two upland swamps on the adjoining national park and council land drain into streams that flow through the land. The land is dominated by an unbroken canopy of majestic angophoras, with a substantial understory of coastal banksia. 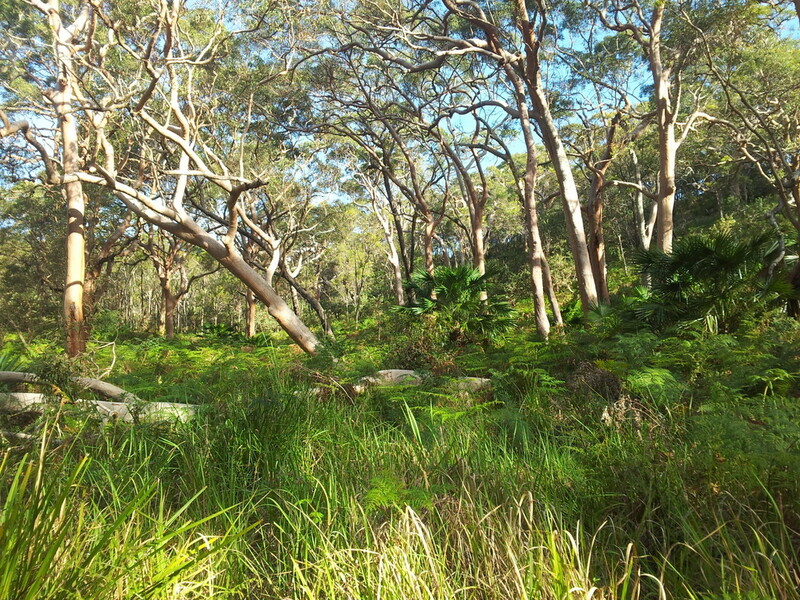 Vegetation on the land is suggestive of coastal sand bangalay forest (EEC), swamp sclerophyll forest (EEC), Sydney freshwater wetland (EEC) – also mapped as upland swamp (EEC) – and Sydney sandstone gully forest. The wetland contains large meadows of sedge grasses. Along the wetland tall groves of cabbage tree palms block out the light. Palms, lilli pilli and breynia dot rocky ravines with waterfalls that roar after heavy rain. Upstream, on the cliff sand dunes, vegetation is suggestive of Kurnell Dune forest (EEC) and coastal heath. Swamp oak floodplain forest (EEC) is found further downstream. The land is only metres away from the world famous Coast Track – the most popular walk in the Royal. Recently, the community successfully lobbied Sutherland Shire Council to amend the land’s zoning to E2 (Environmental Conservation) in the draft Local Environment Plan (LEP). The community were shocked to learn that additional permissible uses of “recreation camp” and “eco-tourism” have been added to the zoning in the re-exhibited draft LEP. These additional uses will allow conference and function centres, spiritual retreats, recreation and sporting facilities. Council’s definition of “recreation camp” is so broad that a motel, hotel or holiday resort could meet the definition. 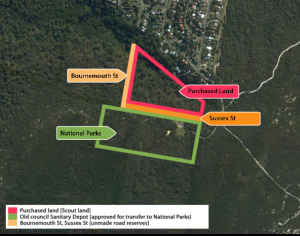 Road access through the Royal National Park, along the start of the Coast Track, will be required to develop the land. Under the Rural Fire Service building code for bushfire prone land, any development will require up to 2.5 hectares (6 acres) of the forest to be cleared for an asset protection zone (APZ) due to the steep slope and isolation from the road system. Only 15% tree canopy is allowed within an APZ – less canopy cover than Redfern. A substantial amount of the forest understory would also be removed. The APZ would extend into the threatened species buffer zone around the wetland. Forest of Bloodwoods growing in rare, possibly unique, malle form on which sugar gliders extensively feed. The developer has made a request to council to buy the adjoining unmade “paper road” (a relic of the 1886 subdivision of Bundeena) which is heavily forested with a significant stand of bloodwood (Corymbia gummifera) growing in a rare, possibly unique, mallee form from enormous lignotubers that stabilise the cliff sand dunes. 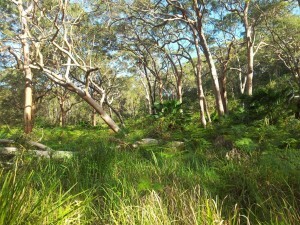 This forest is unusually close to the coast and there is no other known example in the Royal National Park. (figure 3). It is highlighted in the book proposing World Heritage listing for the Royal National Park (First National Park, A Natural for World Heritage by Dr Geoff Mosley). There is extensive evidence of feeding by gliders on these trees. National Parks want the paper roads added to the adjoining Royal National Park. Two hundred and ninety residents wrote to Council opposing a sale of the paper roads for development. The issue remains unresolved. Also in the vicinity is the disused sanitation depot, which is to be transferred to National Parks under an agreement with the Sutherland Shire Council. 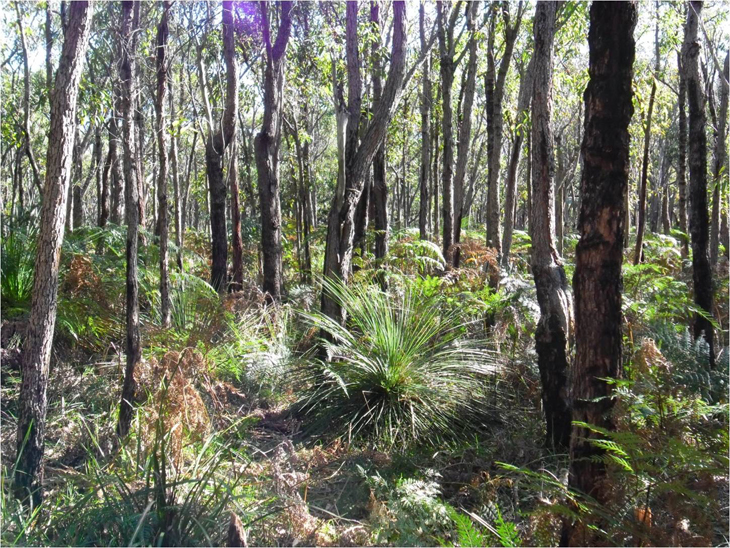 This is supported by the Spring Gully Protection Group, who would like to see all of the land in Spring Gully become part of the Royal National Park. Council is currently organising “round table” talks between stakeholders to explore the possibility of moving the proposed “eco-tourism” resort onto the disused sanitation site. The group is willing to voice their concerns in upcoming talks with Council, RFS, NPWS and the developer. The Spring Gully Protection Group and many residents of Bundeena are willing to help find a solution but will hold steadfast in their belief that widespread clearing for development on this land and its surrounds should not be permitted for any reason.